It could only happen in Mississippi. 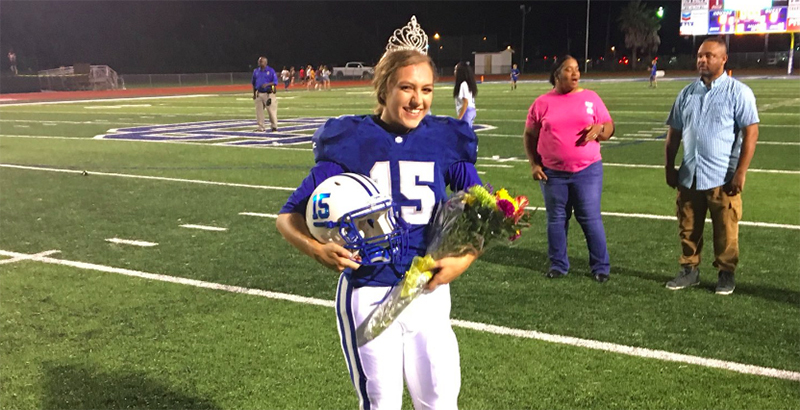 Two weeks ago, Kaylee Foster, 17, donned a tiara and clutched a bouquet as the newly crowned homecoming queen of Ocean Springs High School. Hours later, she won a football game. Kaylee kicked two field goals in a game that ended with the Ocean Springs Greyhounds defeating the George County Rebels, 13-12. Her final boot sealed the deal. This is really fantastic, I love what this young woman and her family have done and what she has done for Ocean Springs. Kaylee’s head coach, Ryan Ross, told Gulf Live Sports, “I’d like to check the whole country and see if it’s ever happened before. It was a rough road. With 40 seconds left in the game, the Rebels were inside the Greyhounds’ red zone, but thanks to an interception, the game went into overtime. Quarterback Blake Noblin found tight end Cade Hurring just shy of the goal line, and Hurring bulled his way into the end zone for the tying score, setting up Foster’s game-winning kick. Kaylee told Good Morning America she didn’t realize she’d won the game.